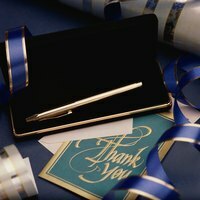 After you have received a gift, you may dread writing a personalized thank-you card, but it is important to write the giver to express your appreciation. Creating a gracious thank-you note shows you really value the gift and the thought put into it. Meaningful thank-you notes should not be greeting cards purchased from a store with just a signature. Instead, thank-you notes should have depth, acknowledging your gratitude for the present and showing your appreciation for the giver. Select a notecard for the task as it should be just the right size. Address the note to the individual you are writing to thank. Use a salutation such “dear” or “hello" and his name. Thank the individual for the gift, mentioning what it is. Include information on how you plan to use the gift, especially if you've already used it. For example, write, "Thank you so much for the birdhouse. I cannot wait until the weather gets nicer so I can hang it outside." Make the individual feel like she is a special part of your life. Make a comment about a past visit or conversation with her, and indicate the next time you hope to talk to or see her. For example,you may write, "I am so glad we got to spend the holidays together this year, and I hope I will see you next summer at the family reunion." Thank the giver again and sign the card with your name. Hand-write the thank-you note with blue or black ink. Do not type or print it. Leave out extraneous information about your life. A thank-you note should be concise. Use words such as "generosity" when writing a thank-you note for a monetary gift instead of including the exact amount.